Start off your visit on the 29th (Fri): kick back and relax at Manly Beach, then take in nature's colorful creations at Royal Botanic Garden Sydney, and then stroll through Bondi Beach. Get ready for a full day of sightseeing on the next day: see some colorful creatures with a scuba or snorkeling tour, catch a live performance at Sydney Opera House, then tour the pleasant surroundings at The Opera House to the Botanic Gardens Walk, and finally take a stroll through The Rocks. To find traveler tips, ratings, other places to visit, and other tourist information, go to the Sydney road trip planner. Tel Aviv, Israel to Sydney is an approximately 24-hour flight. You can also do a combination of flight and bus. You'll lose 8 hours traveling from Tel Aviv to Sydney due to the time zone difference. 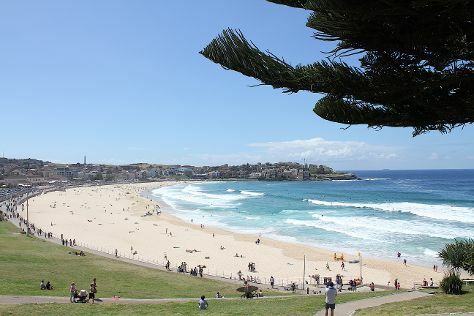 Traveling from Tel Aviv in March, things will get somewhat warmer in Sydney: highs are around 30°C and lows about 22°C. Cap off your sightseeing on the 31st (Sun) early enough to travel to Cairns. Kick off your visit on the 31st (Sun): tour the pleasant surroundings at Esplanade Boardwalk and then step off the mainland to explore Michaelmas Cay. On the next day, discover the deep blue sea with a scuba or snorkeling tour. Find out how to plan Cairns trip without stress by asking Inspirock to help create an itinerary. You can fly from Sydney to Cairns in 6 hours. Other options are to drive; or take a train. Prepare for a bit warmer weather when traveling from Sydney in March: high temperatures in Cairns hover around 36°C and lows are around 27°C. Finish your sightseeing early on the 2nd (Tue) so you can travel to Darwin. Explore hidden gems such as Buley Rockhole and Florence Falls. Get in touch with nature at Safaris and Mindil Beach. Go for a jaunt from Darwin to Humpty Doo to see Fogg Dam Conservation Reserve about 1 hour away. There's still lots to do: identify plant and animal life at Casuarina Coastal Reserve and take in the architecture and atmosphere at St Mary Star of the Sea Catholic Cathedral. To see traveler tips, maps, and more tourist information, you can read our Darwin online route builder . You can fly from Cairns to Darwin in 4.5 hours. Alternatively, you can drive; or take a bus. Traveling from Cairns in April, expect nights in Darwin to be about the same, around 28°C, while days are a bit warmer, around 38°C. Wrap up your sightseeing on the 5th (Fri) early enough to travel to Adelaide. Relax by the water at Horseshoe Bay and Glenelg Beach. Visiting Aldinga Beach and Gorge Wildlife Park will get you outdoors. Next up on the itinerary: steep yourself in history at Adelaide Oval, appreciate the history behind The Rundle Mall Pigs, and find your balance on the water with some of the best stand-up paddleboarding in the area. To see traveler tips, ratings, maps, and other tourist information, go to the Adelaide trip itinerary maker app . You can fly from Darwin to Adelaide in 5.5 hours. Alternatively, you can drive; or take a bus. 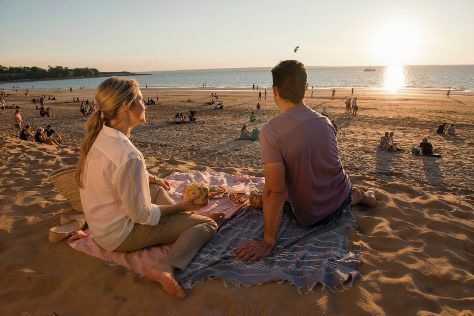 When traveling from Darwin in April, plan for little chillier days and colder nights in Adelaide: temperatures range from 26°C by day to 14°C at night. Wrap up your sightseeing on the 7th (Sun) to allow time to travel to Anglesea. Take the guesswork out of planning a Kangaroo Island vacation by using our trip itinerary maker. You can fly from Adelaide to Kangaroo Island in 2.5 hours. Alternatively, you can do a combination of car and ferry; or do a combination of bus, ferry, and taxi. You will leave for Anglesea on the 7th (Sun). Anglesea is a town in Victoria, Australia. Kick off your visit on the 8th (Mon): get great views at Point Danger Lookout, then kick back and relax at Fisherman's Beach, and then identify plant and animal life at Coogoorah Park Nature Reserve. For ratings, where to stay, and other tourist information, you can read our Anglesea route planner. The Route module can help you plan travel from Kangaroo Island to Anglesea. In April, daily temperatures in Anglesea can reach 24°C, while at night they dip to 11°C. Finish up your sightseeing early on the 9th (Tue) so you can travel to Port Campbell. Port Campbell is a coastal town in Victoria, Australia. 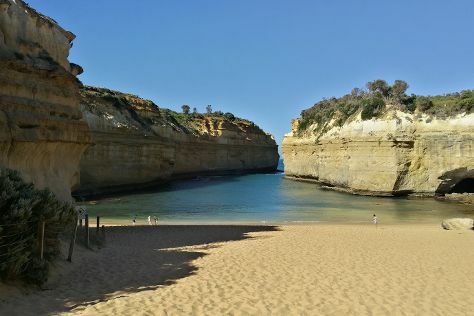 Start off your visit on the 9th (Tue): contemplate the waterfront views at Bay of Martyrs, then get outside with The Arch, and then explore and take pictures at Loch Ard Gorge. Here are some ideas for day two: explore the wealth of natural beauty at Port Campbell National Park. To find where to stay, other places to visit, photos, and other tourist information, go to the Port Campbell vacation site . Traveling by car from Anglesea to Port Campbell takes 2.5 hours. Finish up your sightseeing early on the 10th (Wed) so you can travel back home.